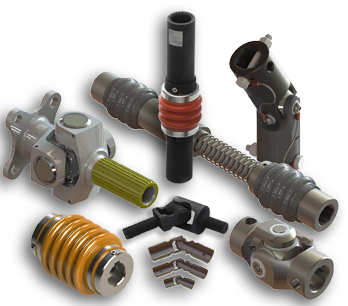 Beldon Universal | Ohio Belting & Transmission Co.
As a distributor for Belden Universal, we make it easy for you to buy the universal joints and couplings you need. Want to order a universal joint or coupling you can't find? Belden Universal is a leading manufacturer of high-quality standard and special-purpose universal joints, drive-shaft assemblies and couplings made to customers’ exact specifications. Cutting edge, innovative manufacturing technologies and processes give them the flexibility to produce small batches and custom parts just as cost effectively as high volume standard universal joints. Some of their capabilities include customized hub configuration, length or the complete redesign of joints for special applications. Belden Universal delivers solutions to all industries and applications where power is transmitted. The universal joints are available as heavy duty, high strength, leveler strength or needle bearing, manufactured from a broad array of materials and platings.